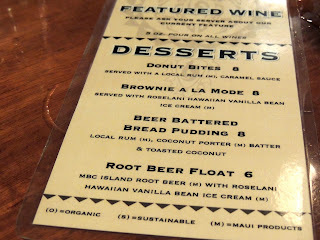 For dinner tonight, we stopped by the BrewPub at the Maui Brewing Company. The decor seemed very industrial. I liked the touch of using kegs for overhead lighting. My husband and I aren't really beer drinkers, but I decided to try one of the beer cocktails. 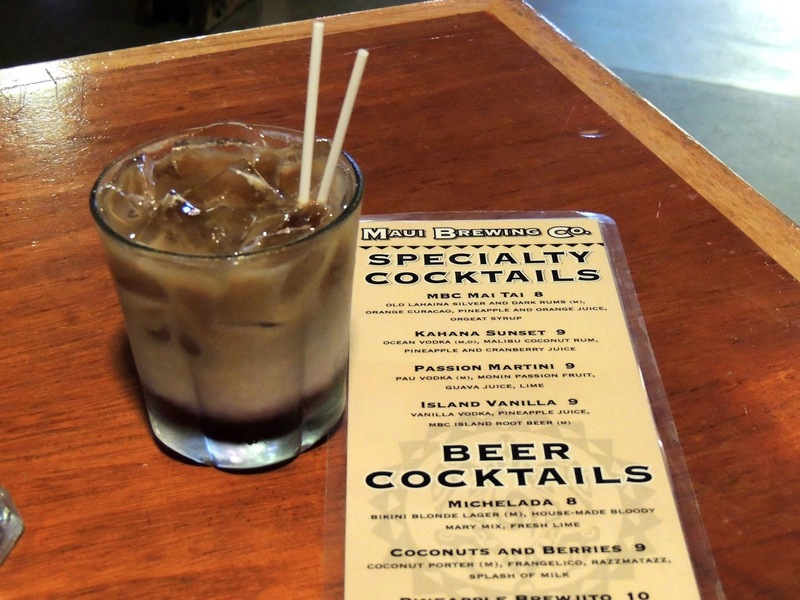 I tried the Coconuts and Berries. They actually brew a coconut beer. Crazy awesome. The Coconuts and Berries was an interesting combination, tasty, but I don't know that I'd get it next time. 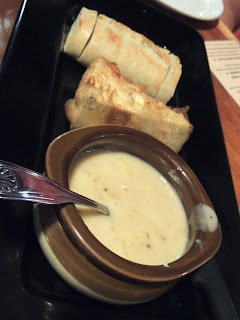 When we were trying to decide where to go for dinner tonight, we looked at the menu online, and when we saw that the Maui Brewing Company had Beer Battered Brie for an appetizer, we were sold. We love triple cream brie and baked brie, so we knew this would be worth trying. It was even better than I expected. In the picture to the right, you see a toasted baguette on top followed by the beer battered brie and caramelized pineapple sauce. Oh my goodness. The sauce had chunks of pineapple in it. The combination was absolutely sensational. I would definitely order this appetizer again. 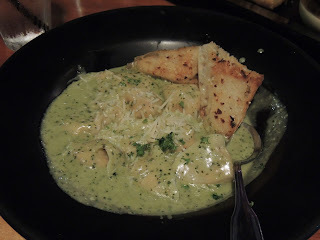 Then we shared the Tortellini which was stuffed with goat cheese from Surfing Goat Dairy (located on Maui) and topped with macadamia nut pesto creme sauce. It was very rich and delicious, but the dominant flavor was definitely the pesto. I didn't taste macadamia nuts. I had to scrape off some pesto to taste the goat cheese, which was good as well. I enjoyed this entree, but next time, I'd probably try something else. 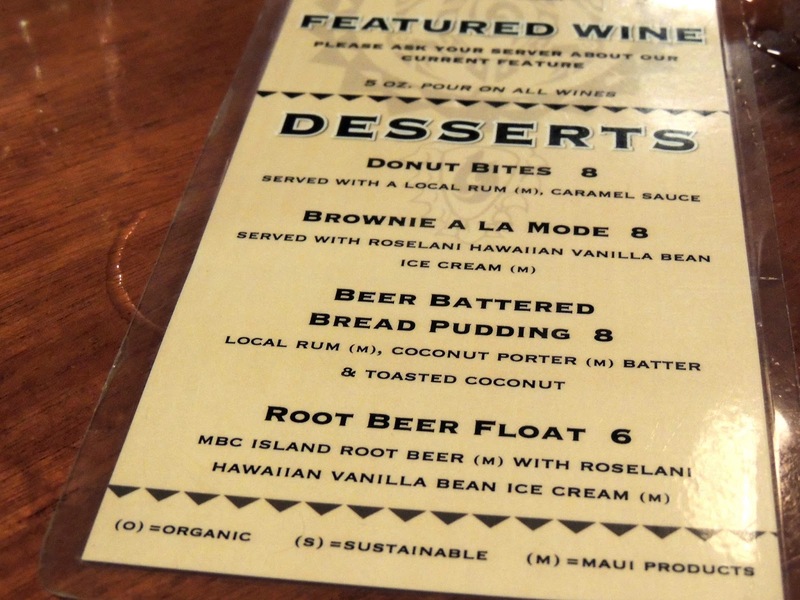 We really wanted to try the Beer Battered Bread Pudding for dessert, but when we asked our waitress, she said that it's discontinued and that they need to update the menu. That was pretty disappointing for us. We went dessert-less tonight. Oh, well. 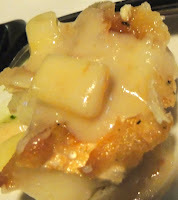 The baked brie was almost like a dessert.